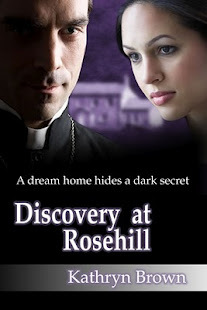 Kathyrn Brown has relaunch her novel this week, Discovery At Rosehill. You can head over to her blog http://crystaljigsaw.blogspot.com/p/discovery-at-rosehill-blurb.html and read an excerpt from chapter One to see if it will get your mind tingling and your fingers hitting that Buy Now button on Amazon! Finding your dream home is difficult enough, but what if you found it and then discovered it was haunted? Medium Camilla Armstrong is led to the beautiful Rosehill country estate after communication with her deceased grandmother. On first inspection she senses tranquillity within the house; the gentle atmosphere of a Georgian manor that is crying out for new life. But when she moves in, Camilla discovers the house contains a dark secret, one which is to change her life forever. When The Reverend Marcus Calloway introduces himself to her, a friendship develops and Camilla realises she could at last have found her true love. But all is not what it seems when further spirit contact confirms that Marcus harbours a guilty secret. Spirit communication, manifestations and an eerie atmosphere all add to Camilla’s new surroundings as she tries hard to decipher mixed messages and a life she never knew existed. An open mind is all she asks for as her relationship with Marcus grows and the secrets of Rosehill are discovered with help from her relatives of a world beyond our own. I had just finished reading a chick lit book which had a slight paranormal feel to it which is not something I usually go out of my way to read ( I am terrible and getting stuck in my comfortable genres!) and yet I really enjoyed that kind of style to the storyline so I decided to come out of my comfort zone a little further and read a much deeper paranormal suspense book. Our main character is Camilla, who is a medium. Camilla didn't come across as the eccentric character I was expecting she felt very familiar and down to earth which made you warm to the character within the first few pages. I have always had an interest in the paranormal so it was quite exciting for me reading the way Camilla communicated with the surrounding spirits. The storyline had a very mystical feel to it but I didn't find that it was too full on at any point. I loved the unusual romance in this book to say it was unexpected was an understatement and to think that I thought I have trouble in my relationship well it doesn't compare to having the unwanted input from a spirit! I think the only place I went wrong with this book is I was silly enough to read this book at night snuggled up in bed!! I have to hold my hands up and say I did sleep with my little lamp on as this book literally sent shivers down my spine! This is definitely one for any of you who like a bit of romance with a difference! Yes, sounds quite intriguing. Adding it to my TBR list. Thanks for sharing! Oh wow - I have this on my Kindle and it's my next to read. Great review which made me very keen to get to Discovery at Rosehill asap!